Item number 07.467.8305 from the Brooklyn Museum. This large, globular basket was purchased from the proprietor of the hotel in Ukiah. According to Dr. Hudson, informant to Stewart Culin, the Museum's curator, it is called a "chi-mo", literally, "Son-in-law). This was given to a man by his mother-in-law or the nearest relative of the bride. After the gift of this basket they may not speak to or even look at each other again. Twined "dowry" baskets are among the largest of all Pomo baskets. The technique here is called lattice twining in which two flexible weft strands twist around an additional, rigid element as well as vertical warp strands. This considerably strengthens the basket. 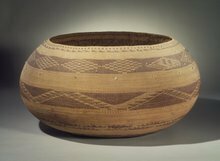 Most baskets with horizontal band designs have an intentional change to the pattern, called a dau. While exact significance is obscure it has been regarded as the doorway for the spirits to enter, inspect, and then leave the basket when it would be destroyed.